New Orleans has a rich cocktail history, one that is includes many of our favorite classic cocktails created by the best bartenders over the years. The tradition of this significant lineage lives on in many of the city's bars and lounges and there is no shortage of fantastic sips when you visit. New Orleans is also home to the Museum of the American Cocktail and host to the annual Tales of the Cocktail. Not only are these cocktails great year-round, they are also perfect for celebrating Mardi Gras. Pair them up with the Brazilian Caipirinha and you will have a very fun Fat Tuesday. Of all the cocktails New Orleans is famous for, the Sazerac is number one. In fact, in 2008 this cocktail was officially named the Official Cocktail of New Orleans. The cocktail has a long, storied, and disputed history which GumboPages.com has in detail. Essentially, it is accepted to be created by Antoine Amedee Peychaud in the early 1800's when he mixed it with his bitters. Originally, it was made with cognac, but somewhere around 1870 Thomas Handy took over the Sazerac House and changed the base to rye whiskey and that is how the cocktail is made to this day. The Ramos Fizz (or New Orleans Fizz) in one of the famous New Orleans cocktails that has stood the test of time and tired many bartender's arms. It is possibly the most famous gin cocktail beyond the Martini and Gin & Tonic for a good reason, it is a superb cocktail. This fizz came to light in the late 1800's thanks to Henry C. Ramos at Meyer's Restaurant in New Orleans. To add to the story and show just how tempting this cocktail is, there is a story about Huey P. Long (Governor of Louisiana, 1928-1932) bringing a New Orleans bartender to New York to train bartenders there so he could have a proper Ramos Fizz whenever he was in the city. The Hurricane is a New Orleans cocktail that is going stronger than ever, especially among the many tourists who visit the city. This very fruity, very rummy cocktail was a sort of fluke which I'm sure Pat O'Brien didn't think would last, certainly not this long. It was in the 1940's that O'Brien found too much rum in his bar and decided to create this drink to relinquish the majority of the supply in order to buy more the popular whiskies of the day. Well, as we can now tell, his cocktail was a hit despite his motives. It has since become the ultimate party cocktail of the city and led to many hangover pains. Rye whiskey and Peychaud's Bitters make yet another appearance in another of the essential New Orleans cocktails. The Vieux Carre is simply one of those cocktails that if you have yet to try, you are missing one of the experiences of a lifetime. The place to get a Vieux Carre in New Orleans is the Carousel Bar in the Hotel Monteleone. Not only is this hotel the main site for the annual Tales of the Cocktail, but it is the birthplace of this classic cocktail although it is not as old as one may think. 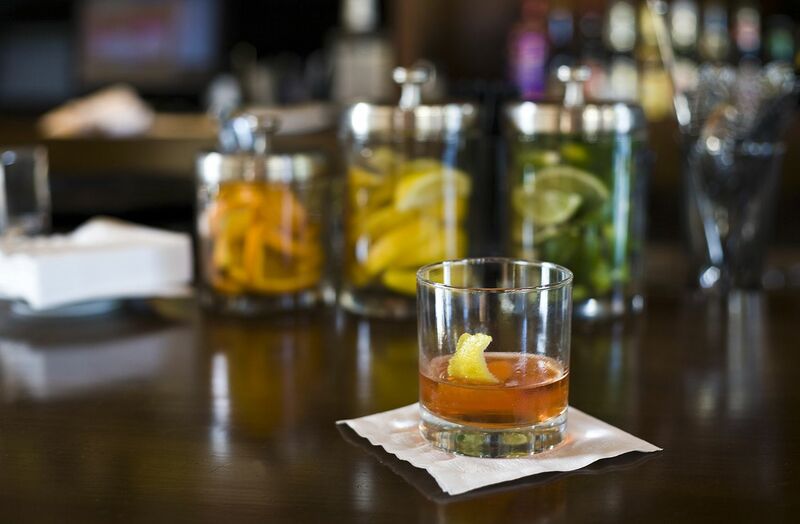 It wasn't until the 1930's that Walter Bergeron first mixed this libation, appropriately giving it the French name "old square," which refers to the French Quarter the hotel is nestled in.